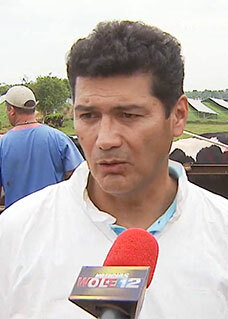 Adalberto Pérez de León in the field speaking about a three-year research project on cattle fever tick management to protect livestock herds in Puerto Rico from tick-borne diseases. A broken arm at age 5 instilled in Adalberto Angel Pérez de León traits that have characterized his life’s work: discipline, pluck, and tenacity. Although right-handed, he learned to write with his left. Swimming first to strengthen both arms evenly led to swimming competitively at state (Indiana) and national (Mexico) levels. “It is humbling to appreciate how everything is interconnected,” says Pérez, who now serves as laboratory director of the USDA-Agricultural Research Service (USDA-ARS) Knipling-Bushland U.S. Livestock Insects Research Laboratory in Kerrville, Texas. Research conducted there helps keep the United States free of the ravages of cattle fever ticks and screwworms and benefits livestock industries and human lives worldwide. Pérez says although he was an urbanite growing up in Veracruz, Mexico, he nurtured a keen interest in animals. As a teen, he collected a book series, with his father, called Enciclopedia de la Fauna about animals and habitats around the world. (He still keeps it.) After returning from a year as an exchange student in Indiana, he pursued a degree in veterinary medicine because at the time his hometown university didn’t offer a bachelor’s in zoology. An internship in pathology toward the end of his veterinary studies introduced him to research as a way to address scientific questions. Today, Pérez is frequently invited to speak on issues in pest management, disease transmission, and vectors in countries such as Argentina, Brazil, Mexico, China, Ukraine, and New Zealand. “It’s no secret I stood on the shoulders of giants,” says Pérez of his experience as a doctoral student in the College of Agriculture and Natural Resources. One of those he credits is his co-adviser Jack Lloyd, who died in March 2018. “Jack unleashed the potential of students as scientists and helped us become research visionaries,” he says. At UW, Pérez conducted interdisciplinary research looking at diseases caused by microbes transmitted by arthropods – animals with jointed legs, such as insects and ticks. He made foundational discoveries on how bioactive factors produced in biting midge salivary glands enhance the transmission of viruses causing bluetongue, a disease that affects livestock. “It is amazing how much talented people from all over the world can learn when challenged with solving problems together,” he says. In the basement of the Agriculture and Natural Resources Building, Pérez shared an office with three other international students. “Jack and Deanna Lloyd, among others, made us feel part of the UW family,” he adds. After graduating in 1996, he continued his research with a postdoctoral appointment at the USDA-ARS Arthropod-Borne Animal Diseases Research Laboratory then at UW. His subject was the transmission of vesicular stomatitis viruses by blood-feeding insects. His family life was established during his seven years in Laramie as well. Pérez married his wife, Valerie, at the Laramie Plains Museum on a cold January day. Two of their three children were born here. “They can claim the honor of being cowgirls,” he says. Their son was born after the family moved to North Carolina. The connections landed him at the University of Georgia, where he earned his master’s degree in entomology. While Pérez was there, Christopher Chase, then with the USDA-ARS Laboratory in Laramie, made a travel detour for a recruitment visit. In a move Pérez likens to “letting go of the swing,” he left the ARS in Laramie to work for national and international corporations for 10 years, overseeing research and managing science and technology programs in the U.S. and abroad.